I know that the name of these cookies is kind of redundant . . . but what else do you call them? 🙂 If you have not noticed by now, we love Oreo’s in our family and the thing that I love about these cookies is that there is a box of pudding in them, making them so soft! My family loved them . . . and if you love Oreo’s, you will too! These cookies are loaded with Oreo's and the secret ingredient is a box of cookies and cream pudding, making them so soft and full of flavor! In a large bowl, cream butter and sugars together and then add pudding mix until blended. Stir in the eggs and vanilla. In a separate bowl, combine the flour and baking soda with a whisk then add it to the wet ingredients. Stir in the chocolate chips and Oreo cookies. Drop cookies by rounded spoonfuls onto greased cookie sheet. Bake for 10 minutes in preheated oven until cookies tops barely have a touch of brown (do not over bake). The Best Freezer Meals from Six Sisters’ Stuff! 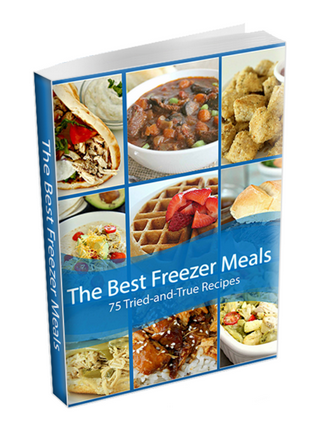 Inside you will find 75 of our Tried-and-True Freezer Meal Recipes that our families have loved . . . with easy instructions and tips to help make meal planning and prep a breeze. Get this ebook for only $4.99! My husband would love these! Cookies and cream is his favorite flavor of ice cream. These look delicious! These cookies look divine! 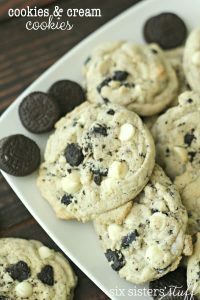 I love cookies and cream anything - I cannot wait to make these! Thank you so much for your kind words about my Lemon Cake & Sugared Strawberries - and for featuring it this week! I love visiting the sisters every week! YUM! My favorite cookie recipe has vanilla pudding mix---I LOVE how moist they are. I will have to try these!! All I have to say is....HEAVEN! These babies are going to make me the cookie exchange party WINNER! omg, they use to sell these at Great American Cookie and they stopped. I have looked for a recipe for these for about 2 years. Can't wait to make! Thanks for sharing! can't wait to try these, thanks for the recipe! Yum!!!!!! So good! I am sampling one fresh from the oven right now! Loved them. Made for a cookie exchange tonight. Was looking for something unique! Help! I don´t live in the US and I don´t know where to buy cookies and cream pudding. Perhaps I can search for the recipe, but can you tell me the quantity. Just wondering if I am supposed to prepare the pudding mix (add the milk) before putting them into the creamed butter, or do I just put the dry mix in? @ Jim- Hi! I use the 4.2 ounce box of Jell-o Brand Cookies and Cream pudding mix- it's just a dry mix, not the wet gooey pudding. :) I have been searching online for a recipe for the "dry pudding mix", but I haven't found anything! I am so sorry! If I ever find anything, I will let you know! Thanks Camille! Our cookies turned out fabulous!!! Would you say that these are the chewy kind of cookies or the puffy kind? I'm not a fan of cakey cookies but im not sure what to look for? @Anonymous- I am not sure how to describe these cookies . . . they are incredibly soft (from the pudding) . . . maybe more like a puffy kind? @Kandy- I am so sorry that I missed your question! To be honest, I can't remember if it's instant or cook and serve. I know that at my grocery store, there was only one box of cookies and cream pudding, so that is what I used. I want to say that it's instant. Next time I am at the grocery store, I will double check! Added these to the cookies I make for Christmas. They were delicious. Though I may put less oreo cookies in next time. Just saw these on pinterest. I'll definitely have to try these! I've made these a couple times now and I think the key is to use vanilla pudding mix. It adds more sweetness that pushes them over the edge! It also helps to make them really big so they come out more chewy than crisp. It has been raining all weekend so I decided to make these cookies and they were delicious! Nice and fluffy. I used 1 row of Oreo cookies from the package at the advice of another commenter and they still turned out fine in my opinion! I could probably eat all of the cookies today if it keeps raining! Note: I added the dry pudding mix to the creamed butter/sugar mix as mentioned below. 1 row of Oreo cookies is 13 cookies. I just make these and used Sugar Free french vanilla instant pudding mix since my town didn't seem to have the cookies and cream mix. I think they turned out delightful! Made these yesterday but made my own changes. 1. Used dark chocolate instead of white chocolate chips. Let's face it, dark chocolate is just better. 2. Used 1/2 cup butter and 1/4 cup of Greek yogurt. Made it creamy and healthier. 3. Good luck finding cookies and cream pudding mix. I used cheesecake and it was awesome. I made these a couple of days ago and they're delicious! I used red cream Oreos to make them more festive. They're so rich that next time I may cut out some of the chocolate chips. Thank you for the great recipe! No, don't make the pudding! There are enough wet ingredients in this recipe for cookies, by adding milk you are making a batter-like texture and won't bake/spread right. So do I make the pudding or just add it dry? and also, do I take the cream out of the oreos or leave it in? Hi Ellie, this recipe makes about 3 dozen cookies. I always get asked for this recipe every time I make them, they are delicious! I was bummed because I couldn't find cookies 'n cream pudding in the stores anymore, but I just used vanilla and crushed a few Oreos and they were just as good. I followed the instructions seemingly to-a-T but the cookies came out a little spongy. Should there be salt in the recipe or is there another suggestion from those who were successful? Thanks! Hi! I absolutely love these cookies! One question; I'd like to make these for a large group of people but won't have time to have them fresh. Can I make the sough 2 days before and chill it? Thank you! Made these and won a cookie contest today! Congratulations!!! That is so fun. OMG these were amazing! Made a batch, for my husband and I....and being the good Dad that I am, wrapped some up for our adult daughter. We all loved these!! Unfortunately we had to use the Vanilla pudding dry mix, but honestly these were the best darn cookies I've ever made, thanks to you. I ended up freezing a dozen, for moderation - LOL. @ the "Anonymous " user who referenced these looking like "ashtray" cookies, didn't your mama teach you that if you can't say something nice....don't say it? Kind of a crass unthoughtful comment. I made these just as written and they were beautiful, liked just like the first 2 pictures! These will be my go to cookies from now on. Yummmm! ? This recipe is amazing! I found it like 5 years ago on Pinterest and have made it for every holiday and family event since! Every time I make it, I have a new person ask me for the recipe! Thanks for sharing! PSA ALERT: BEST COOKIES I HAVE EVER MADE. BEST ANYTHING I HAVE EVER MADE OR EATEN. I am not joking. These are the best things I have ever eaten. My favorite food. I have made them countless times and have never had a bad batch. I am in high school and started making them in 7th grade. You cannot mess up this recipe. My friends beg me to make them at every event! I gave someone the left over cookie dough once and they cried. I’m not messing around. Hands down best things on earth. If ur skeptical, don’t be. PLEASE MAKE THESE FOR THE LOVE OF GOD DO IT. I don’t care if you have to spend $20 at the food store. Do it. Make them. Eat them. Hi Lucy. This is definitely the cutest and funniest comment we have ever received. We need to hire you to promote our recipes. Ha Ha! We all know that if OREOS are in the recipe that it has to be amazing. (We are OREO lovers). Tell your friends we say thanks for begging you to make these over and over again! Have a terrific week and best of luck with a new school year starting. And keep up the baking!! I made these for a work event and everyone LOVED them!! I doubled the batch and used one Oreo cookie pudding mix and the same amount of cheesecake pudding mix (weighed 4.2 oz). I also only added 3 cups of white chocolate chips instead of 4 cups. They were amazing and definitely sweet enough with a great texture!! I will absolutely make them again. Thank you! My daughter and I can’t wait to make these cookies! Do you remove the cream filling from the Oreos before using them? We are having a debate about that. ? Thank you! You will want to leave the cream filling in the cookies.